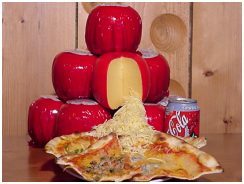 The most obvious association with the name ‘Edam’ is its cheese. For centuries the well-known round Edam cheeses have been sent from this town to all corners of the world. The cheese market, once again restored to its place of honor, is enacted weekly during the summer months. And nearby cheese warehouses keep alive the memory of a colourful past. However, Edam is more than cheese! Edam is a city with a rich history. It began in the 12th century, when farmers and fishermen settled along the little Ye river. With that ‘Yedam’ was a fact. This primitive settlement developed into an increasingly prosperous town well into the 17th century. Shipbuilding played an important role in this growth. Once Edam had 33 ship-yards building many famous ships. A good example is the ‘Halve Maan’, the ship that the Englishman Henry Hudson sailed in 1609 when attempting to discover a northern route to the East Indies. A futile attempt in fact, because he ended up on the island of Manhattan! Beside shipbuilding, commerce was a major contributor to the thriving development of Edam. Together with Amsterdam, Hoorn and Enkhuizen, Edam was one of the most important commercial towns in Holland. Today Edam is a town with authentic 17th century architecture, convincing proof of its rich past. When walking along the old streets and quiet canals, one can easily imagine how it was in a Dutch town centuries ago. Well preserved gables, squares, bridges and monuments capture and hold the attention of the visitor. A stroll takes one past the tea-houses on the ‘Schepenmakersdijk’, the leaning Carillon tower (1561), the historic museum with the floating cellar, the Dam, the Town hall of Edam to the Great Church. This is one of the largest churches in the Netherlands. It has an extraordinary collection of richly coloured stained glass windows dating from the 17th century. Edam has more: cosy shopping streets and nice terraces where one can enjoy a drink or a snack. There is the ‘Strandbad’ camping on the edge of the IJsselmeer, countless watersport fans from far and near have found their way to this camping site and public swimming area, just outside the centre of Edam. We could easily continue summing up the attractions Edam has to offer, but prefer to invite you personally to come to Edam and discover for yourself the quiet and beauty of this little IJsselmeer town. 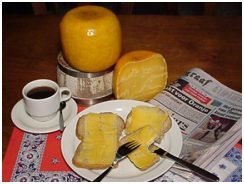 To order some original Edam cheese, visit the Henri Willig homepage. © 2005 Edam.com all rights reserved.